6. I purchased a 100 ml tester of Moustache without ever sniffing it. Today, in part 8 of the chain reaction (part 7 was wearing the fragrance for a week) I’m reviewing Moustache. As one might expect, Moustache has changed since 1948-49. Today’s list of ingredients (bergamot, lime, pine, moss, vetiver, rare fruits) pales beside the older list (lime, lavender, basil, lemon verbena, petit grain, bergamot, lemon, honey, carnation, jasmine, rose, geranium, tonka bean, amber, musk, oak moss, vanilla and cedar.) Yet, in the version of Moustache I purchased (I bought a vintage sample to compare it with…more on that later), I can smell notes from both these lists. “Recent” Moustache (in the bottle pictured below, left) opens with a delightful, tart/dry lime aroma. As this note slowly evaporates (this is one long-lasting citrus note) it morphs into a grass-y note (think golden, dry grass, not “green” grass). At this stage, things become even more interesting: I smell a very original accord that veers between floral (maybe jasmine) and ‘fruit’ (certainly an engineered aroma with ripe citrus, candy citrus, talc-y citrus facets). I also detect some piquant honey mixing with sheer ‘leather’ in the background. Next up: the Kouros-lite stage — a combo of some smooth musk and sweet (animalic, yet somehow still “patrician”) sweat. WARNING: If ever our eyes lock over a bottle of vintage Moustache at an estate sale or shop, I hope you’re wearing football shoulder pads and a protective helmet for I’ll surely do all I can to wrest that bottle from your grip. Seems like the lime opening could be right up my alley, not so sure about the notes that follow up. BTW Nice gravatar, so Egyptian. I can completely relate to the perfume chain reaction! And why does it so often end with a search for some difficult-to-find vintage formulation for comparison?! Urgh. Ebay should give royalties to NST, I swear! And while we’re on the subject of ebay, can I whine about the phrase “100% Authentic?” Seems rather redundant to me. How could a scent be anything but either authentic or not authentic? Not like there are degrees of authenticity! (I’m going to mix the original formulation with some bourbon–so it’s 50% authentic!) Am I just being cranky? Oh, love the new gravatar — perfect! yes – what a wonderful gravatar, Kevin! Oh, yes, the Perfume Chain Reaction! Lovely review. Doesn’t sound at all like my kind of thing, but I’m enjoying it vicariously. I’ve been debating for almost 2 years as to getting a bottle or not. Looks like I will get to it as soon as possible! Kevin: I agree! You perfectly described what has happened to me more and more the past 2 years on ebay. The train reaction: wanting something so bad, taking that unsniffed risk, and then trolling over hard to find bottles that I should have picked up when they were available, ignored, and mostly inexpensive. If I ever see a bottle of Moustache, I’ll make sure I grab it, and that you aren’t anywhere in sight! I have been wearing Moustache since 1968. In the past 50 years the fragrance has become slowly weaker and more pathetic. The final version was but a pale copy of the original. 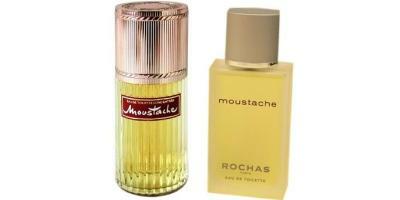 Robwales: I guess we can hope Rochas perfumes will be treated with respect again…but probably Moustache would not fit in with today’s mainstream tastes. Helen: I DO like Boulder…. LittleCooling: you’re welcome…I hope to explore/review other older fragrances in the near future. Thanks for the review Kevin-I love lime in a fragrance, I’ll have to scour fleabay for a vintage bottle ot the stuff. I love men’s scents in summer, especially with leather notes. Smokey: this is a great summer scent. I would buy this for the name alone ! I am fond of a generous handlebar moustache ! Lol ! Thanks for shedding light on this one , yes the original bottle is a beauty, great art direction . It seems in the ad to suggest a incognito , private detective vibe ! Would u slip by unnoticed with this one on ??? sinnerman: ha! Nope…you would NOT be “blending in” while wearing Moustache. Perfume Chain Reaction, or how I managed to spend every weekend on the internet in 2009-2010. I’m better now – really! Noz: I know…but I’m the type who changes my screen saver once a week! It’s a miracle I kept my tiger for years! 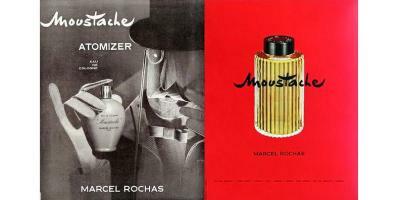 Moustaches are so “in” right now that you’d think Rochas could try to capitalize off the name. I swear, just do an Etsy search and you find so much moustache- themed stuff. I’ve even seen several moustache-themed weddings (I’ve been wedding planning and reading wedding blogs)! Some of my students were wearing them as fashion statements this spring–girls, mind you! Fake mustaches or necklaces with mustaches on them. Or they’d draw one on their hand and place their hand over their mouths to slip into disguise! Pretty funny stuff! Great article and review, Kevin. The fragrance sounds rather special! Another link for your chain, Kevin: Your review prompted me to get a mini travel bottle (looks like the left-hand one in your second picture). I think it’s wonderful, and it’s swoon-worthy on my husband! Haunani: the chain reaction is complete! So glad it worked for you. toomawashi: Air Madagascar! Who would have guessed….